Odoo Website Pathology Lab Management System provides the facility for customers to book a lab test along with the date and center directly from the website. After the successful completion of the test, the test report will be sent to the patient via email or the patient can also download the report from his account. The concepts and design of the Odoo Website Pathology Lab Management System module are to ensure that it can meet the demanding requirements that an ideal software should have to manage today’s busy pathology labs. Since Labs are now considered to be one of the highest sources of revenue. Therefore, this module will help you to expand your business, process more samples, and increase your revenues. Provides facility to book a test directly from the website. Customers can see all the test of pathology and read its details. Customers can add the test to cart to book it. Admin can select Categories in the lab test and test packages for easiness of customers. 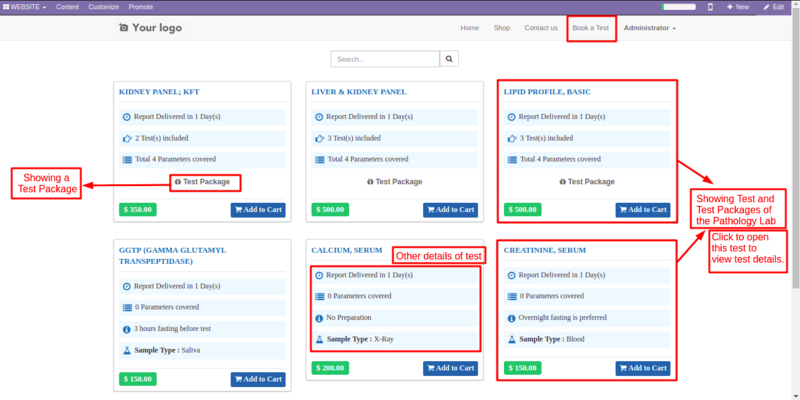 Customers can select lab test and test packages according to Categories defined. 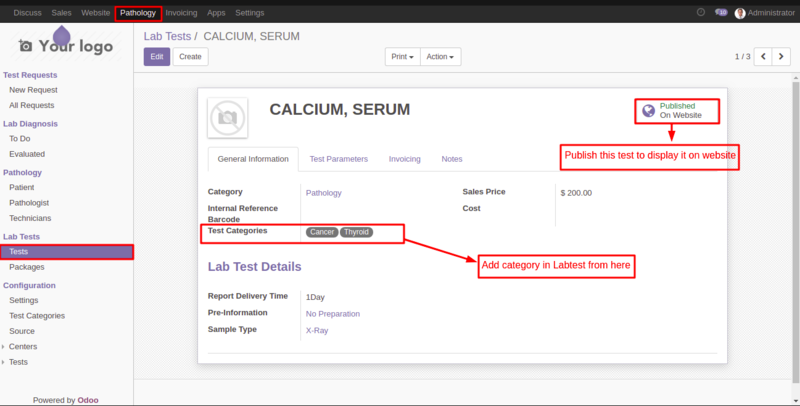 Admin can publish/unpublish both lab test and test packages to display test on the website. Facility of Email notification on confirmation of Test Request. Facility of Email notification on completion of Test Report. Also, test report can be sent to the patient via email. 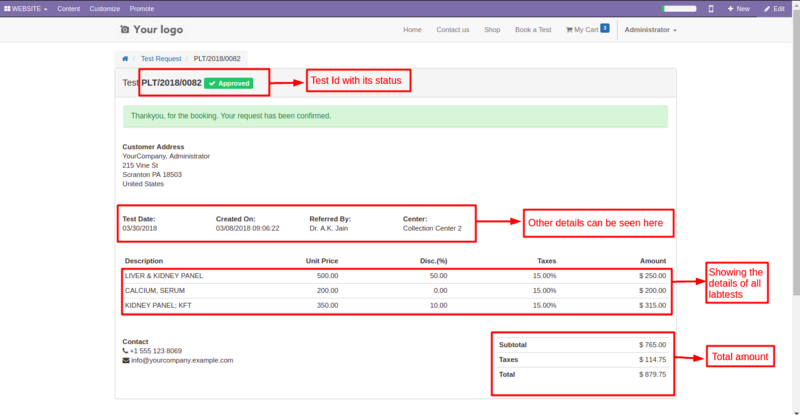 A customer can view all the booked Test Request in their Account and download the report from their only. After buying this app from our Webkul store you will get the link for downloading the zip file. 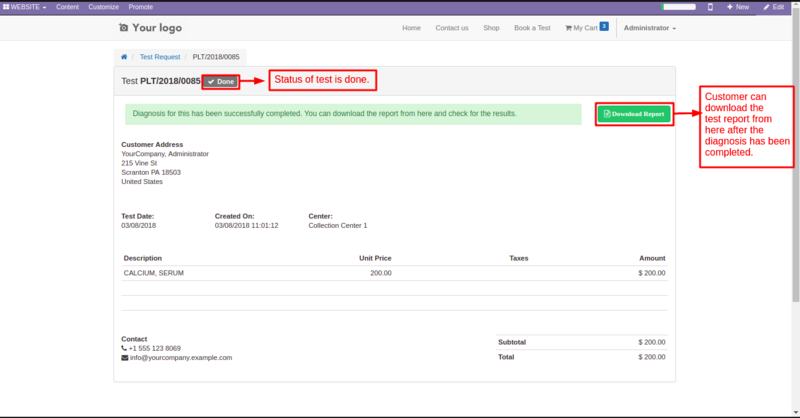 Simply download it and extract then you will see the website_pathology folder, now you will have to copy this app folder inside your Odoo addons path. 3. Remove the app’s filter and search for the website_pathology key. After installing you will be able to handle different functionality as mentioned in module’s workflow. Firstly admin needs to create few Lab test categories these categories will be added in lab test packages to categorize test for customers. 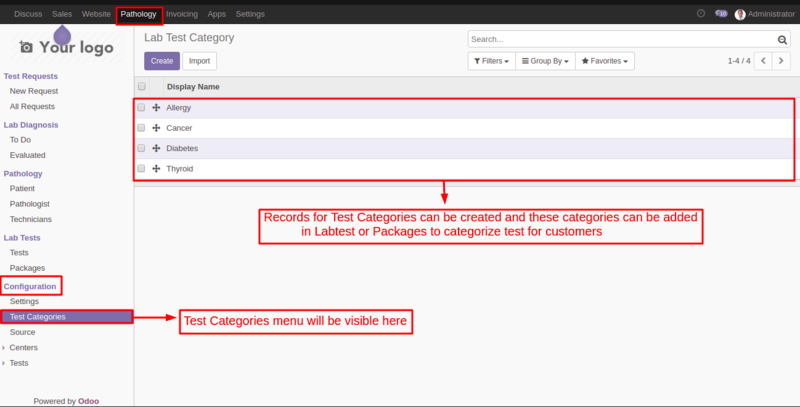 Test Categories menu will be added under configuration. Inside a lab test Test, categories are added which means this lab test belongs to this category. Also, publish the lab test to make it visible on the website. 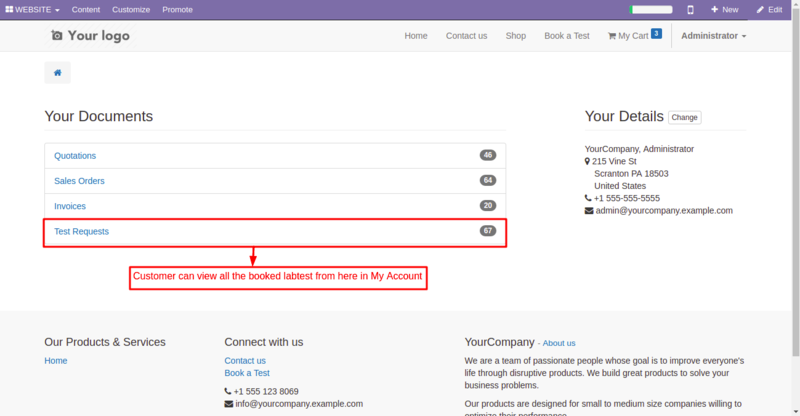 On the website view, you can easily customize the book a test link just by enabling or disabling the menu of Book a test. 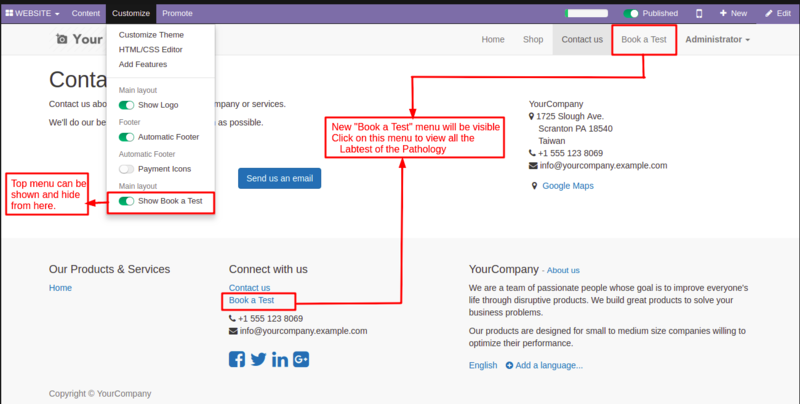 A new ‘Book a Test’ link will be visible to the customer. 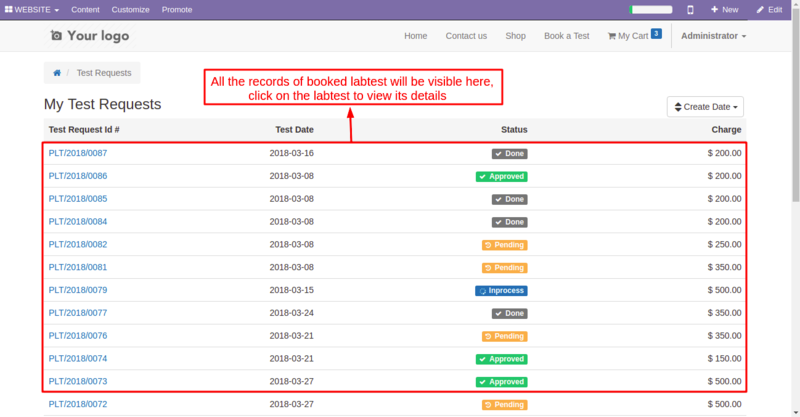 On clicking on ‘Book a Test’, all the tests created by the admin will be visible to the customer. Therefore the basic details of the test will be displayed. A patient/customer can click on a particular test to check all the details of the lab test. Also, the link of the corresponding test package will be linked to that lab test. This module will also provide a Filter box showing test categories. Hence, customer searching for a specific lab test or package can easily filter them just by selecting the category. On clicking a particular test its details will open where the customer/patient can check the overview of the lab test, Details for patient tab contains those details that a patient is required to know for that test. Test covered tab shows all the test covered in this test package along with all the parameters of this test. Once confirmed the details about the test the customer/patient can add the test to cart to proceed with the booking. Also, select the date for conducting lab test along with the collection center. 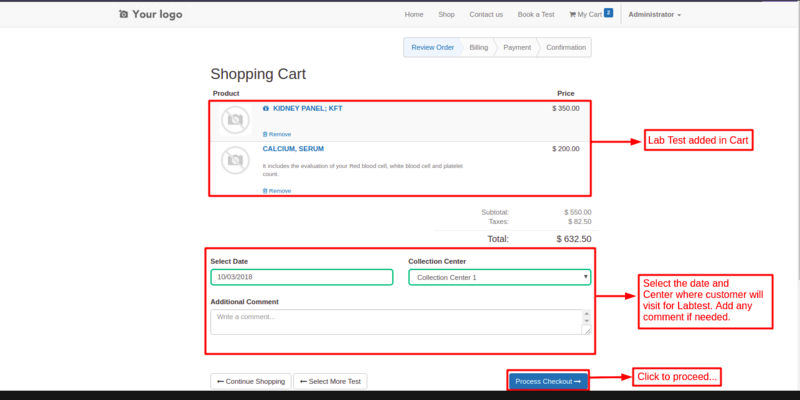 Also, a customer can add additional comments in the comment box and finally click on Process checkout button to proceed. Complete the payment process here to confirm the booking. The customer/patient can also update the date and collection center before paying. Once the payment is confirmed the test request will be created on the backend and the customer will receive the message for registration which once confirmed then the customer/patient will be notified. A customer can view the booked test details on the test request menu under the option of My Documents. Admin can check all the lab test of customer logged-in Under the menu of My test requests. On clicking any lab test, the following details can be checked. The customer can directly download the Diagnosis report just by clicking the button of Download report once the test is done and can check the results of the test.